In cyclothymia, hypomania and mini-depression alternate with each other from adolescence. For instance, the optimistic, overconfident, people-seeking phase can give way to self-absorption, self-doubt, pessimism, and a sense of futility, emptiness, and suicidal ideation. More commonly, depressive periods dominate the clinical picture, interspersed by 'even', 'irritable', and occasional hypomanic periods. Indeed, most people with cyclothymia who present clinically do so because of depression. (80) These depressions are typically short-lived, yet unrelenting in their cyclic course, creating much interpersonal havoc for the patient. The following vignette illustrates the cardinal clinical features of cyclothymia that has not yet progressed to major depression. Case Study This 24-year-old songwriter presented with the chief complaint of 'depression so bad that I become totally dysfunctional—I cannot even get out of bed'. Since her mid-teens she had experienced periods lasting from a few days up to a week, during which she would withdraw into herself, losing confidence and interest, feeling drained of energy, and crying when approached by anybody. These periods were particularly prevalent during the autumn and winter months, but they did not coincide with the premenstrual phase. All she needed sometimes was restful sleep to 'feel alive again'; at other times she would have little sleep, and would wake up 'wired', 'ready to go', 'open to experience all the joy waiting for me out there'; she would exude confidence, 'sensuality and sexual aroma'. These occurred less frequently than the 'down' periods and usually lasted for 1 to 3 days, but were not associated with creative spurts. The latter came as she was descending from 'highs' into a more 'mellow depression'. Her success in music had been sporadic, paralleling the sporadic nature of her 'muses' that visited her on the descending limb of 'hypomania merging with tears'. However, the major toll of her mood swings had been in her personal life, the intensity of her moods had driven away most men she had loved, of whom she had lost count. She described periods of such intense sexual arousal, that sometimes she would go to bed with anybody, including 'women of all ages, shapes, and description'. But, she added: 'I am not a lesbian—oral love is just one way of relating to these women—why not?' She had also experimented with drugs, such as stimulants, which had made her moodiness worse. More recently, she had been prescribed at least two SSRIs, which after a period of 'success' for a few months, had made her depressive swings more frequent and lower in amplitude, leading to the present consultation in our clinic. 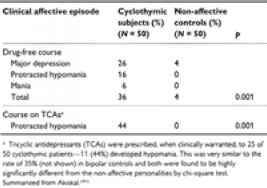 One-third of patients with cyclothymia studied by us on a prospective basis, progressed to spontaneous affective episodes with more protracted hypomanias and clinical (major) depression (Table.6). Thus, 6 per cent of the original cyclothymic cohort could be reclassified as bipolar I, and 30 per cent as bipolar II. 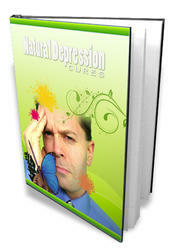 The tendency to switch to hypomania was further augmented by the administration of antidepressants. A larger and more recent National Institute of Mental Health study (91) of patients with major depression who switched to bipolar II during a prospective observation period of up to 11 years, found that a temperamental mix of 'mood-labile', 'energetic-active', and 'daydreaming' traits (reminiscent of Kretschmer's concept of the cyclothymic temperament (39) were the most specific predictors of such outcome. Limited data(92) also exist on the importance of these temperamental factors in predicting which of the offspring of bipolar probands will progress to clinical episodes. The foregoing clinical and course characteristics suggest that a cyclothymic temperament leading to major depressive recurrences represents a distinct longitudinal pattern of 'cyclothymic depression', and which appears to capture the core features of bipolar II disorder in contemporary clinical practice. (891) Because hypomanic episodes cannot be easily ascertained by history, assessing cyclothymia in clinically depressed patients represents a more sensitive and specific approach to the diagnosis of bipolar II.